Our immune system has two vital roles. One is to protect us from danger, such as infections and preventing cancer cells from taking hold. The other is its significant function in repairing our tissues and helping our cells “take out the garbage” on a regular basis. 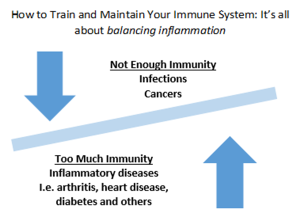 The immune system uses inflammation as the primary weapon in both these functions, but it must be held in impeccable balance for us to stay healthy. Too much inflammation, and we develop chronic diseases such as arthritis, diabetes, dementia and heart disease, among others. Too little, and we’re more susceptible to infections and cancers (see illustration). The good news is that we can tune up our immune system through modifying personal behavior, such as via healthy eating. So, too, does exercise play a role in immunologic health. Most are familiar with the public health recommendations for physical activity and exercise to improve our health. Indeed, the benefits of exercise are indisputable; many studies demonstrate that physical activity is associated with reduced rates of heart disease, stroke, diabetes and dementia. Plus, it helps us achieve and maintain our weight. An underlying principle of exercise and health is that there’s a subtle relationship between the amount of exercise we get and the health benefits we receive. Moderate exercise is most beneficial, inactivity is deleterious and extremes of exercise are not just more of a good thing – they can be harmful, as well. 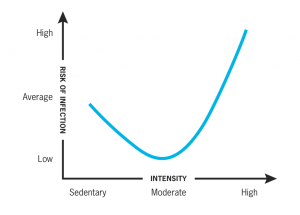 The same relationship exists between exercise and immune health, and we use the “J curve” below to make our point. If we examine this figure, we can see that on the y axis is “risk of infection.” As a starter, recognize that two to four colds and flu-like illnesses per year is about average for a healthy person. Now think of the frequency of these infections as an indicator for immunologic health. Low risk of infection, resulting in few colds and flu, is good and correlates with a tuned-up immune system. Alternatively, high risk of infection, with more frequent episodes, is obviously bad and correlates with an immune response that is subpar. Note that the relationship between exercise on the bottom and immune function on the vertical axis is not a straight line. So, what does this mean? Simple. If you’re at the extreme left on this graph, you’re in the couch potato zone. If you’re at the extreme right, you’re an overzealous exerciser. Those in the center, who have the lowest risk of infections, are on the middle path and engaged in moderate exercise – that’s where we should strive to be. Now, that’s good news.